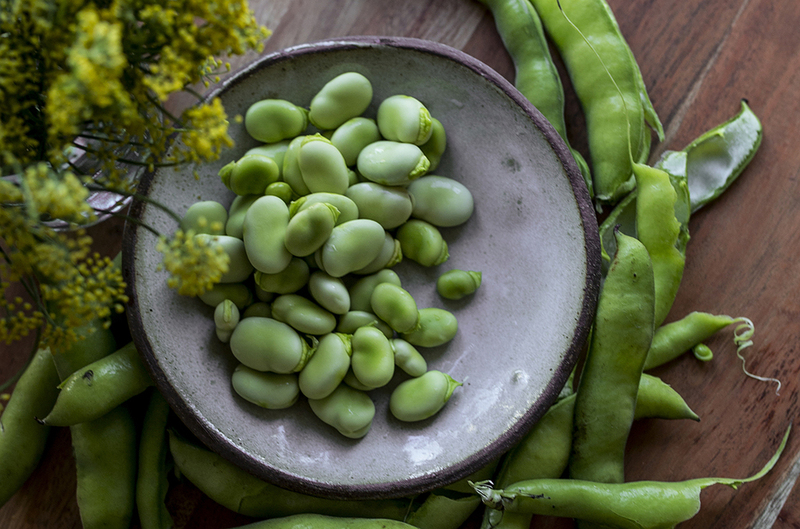 Fresh fava beans are a delicious treat--only around until early May. The season is fleeting so get your hands on some before they're gone! They're buttery, nutty and like Hannibal Lector says, it's great with a glass of Chianti. They're a bit of a pain to prep but well worth it. These medicated polenta cakes are lightly spiced and packed full of nutritious fava beans. Enjoy them for breakfast or as a side to a hearty dinner. 1. Bring a small pot of water to boil. Place the shelled fava beans in the boiling water, allowing them to blanch for two minutes. 2. After two minutes, drain the beans and rinse under cold water. Each bean is covered in a milky white skin that needs to be removed. Peel the skin and pop the bean out. 3. In a large saucepan, combine milk, chicken broth, salt, and bay leaf. Bring the mixture to a boil over low heat. 4. Sprinkle in the polenta, stirring constantly until the polenta becomes thick. 5. Remove from heat and discard the bay leaf. 6. Gently stir in the fava beans, canna butter, cayenne, and parmesan cheese. 7. Line a 7 by 7-inch square pan with plastic wrap. Pour the polenta into the pan and cover the top with more plastic smoothed onto the surface of the polenta. 8. Chill in the fridge for at least an hour. 9. When ready to serve, remove the polenta from the pan and cut into desired shapes. 10. Coat a nonstick pan with canola oil and bring to medium-high heat. Add your cut polenta onto the hot pan and cook until crisp on both sides. Serve hot!